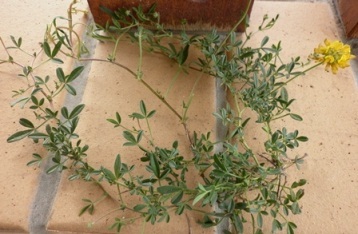 Erect or scrambling annual shrub to 60 cm high. May be smooth to sparsely hairy. 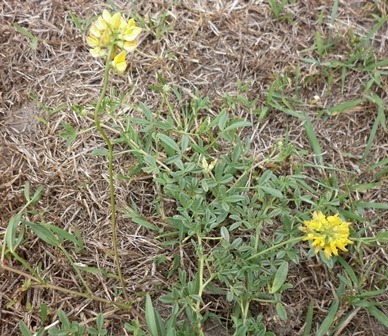 Leaves are 3-foliate (similar to clover). Leaflets are oval, up to 30 mm long and with toothed margins. 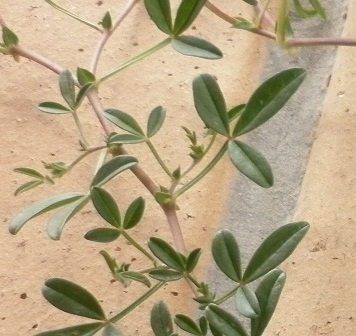 Stem or petiole to the leaflets and flowers may be up to 40 mm long and are toothed where they join the main stem. 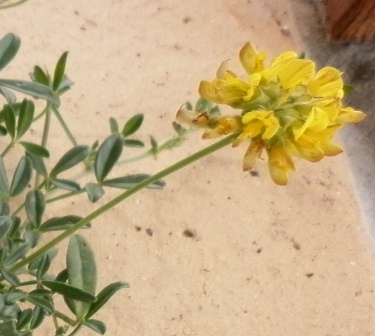 Flowers are yellow, pea-flower in shape, are on stalks carrying 10 to 60 flowers and protrude above the leaves. Pods are 3 dimensional and ball-shaped, 2-3 mm long, wrinkled, green to brown in colour and hold 1 seed. Thanks to Garry for the use of his photos.